Music Under the Stars continues tonight! Enjoy Sumer nights in Cherry Hill! Bring a chair, blanket and even a picnic dinner, just don’t forget your appetite for great music! Each evening features a different musical adventure at the historic Barclay Farmstead. Concerts are cancelled in the event of rain. Enjoy samples from Short Hill's Deli, play in the moon bounce, stop by the B101 tent and even purchase sweet treats from our ice cream vendor! 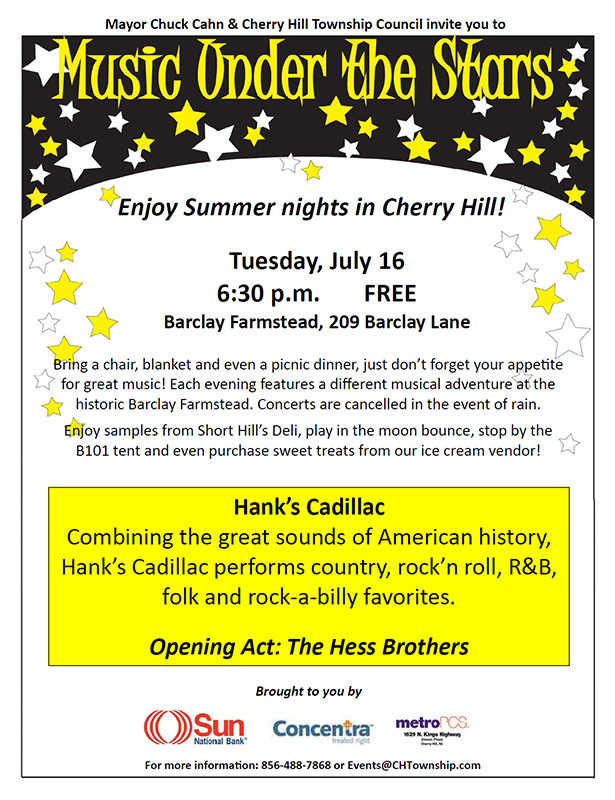 Combining the great sounds of American history, Hank's Cadillac performs country, rock'n roll, R&B, folk and rock-a-billy favorites.